This is the my first release of a Windows 10 x86 PE with updateable usb apps. This portable apps on this version can be updated when needed or you can also add any new apps you need to the USB stick. New applications include Macrium Reflect, Adobe Reader, FastStone Image Viewer , Java and more. Tree Size TreeSize tells you where precious space has gone to Irfan View Fast and compact image viewer/converter. Disk Wipe Erase all disk data and prevent recovery of data. Smart Partition Recovery Lose a drive? Smart Partition Recovery will restore it! Portable Apps Menu If you prefer to use the Portable Apps menu instead then run the Portable Apps Menu shortcut on the taskbar. The portable apps menu also allows you to download more apps by selecting the Apps>Get more apps. These freshly downloaded apps will be saved to the USB drive. May we expect a 64 bits version too? the current 64bit version Does NOT provide support for running 32bit programs (WoW64) in x64 building so it makes it very limited. Tnx for that useful info! The download link to OneDrive is wrong, it is the same as the link to Mega. A suggestion for your next release of Windows PE: You could include ‘Emsisoft Emergency Kit’ (http://www.emsisoft.com/en/software/eek/) instead of ‘ClamWin Antivirus’. ClamWin has a bad virus recognition. Emsisoft Emergency Kit has an excellent virus recognition (because it uses the Bitdefender scan engine) and it is free and portable. Thanks for the quick build. Very nice. Would like to help you and other users with there concerns and issues, but its not going to be possible at this time. My wife was just diagnosed with Pancreatic Cancer. So she is all I really have on my mind for the next little while. Just fount this site while building my own PE. I’m sorry to hear that. My thoughts and prayers to you and your wife. Thank You. She’s a trooper. I wish your wife a quick recovery, and a lot of strenght to you. This work you did here is amazing and helping me a lot in my job, and if someone misses something, it’s just to put your ISO on a USB and copy or install whatever is needed. But, have you noticed that Team Viewer is not working? now i did ;) it didn’t seem to like the win7pe build either. I think it’s because there isn’t an account in winpe. The team viewer log shows it too. That requires a complete rebuild. It cant be done to the iso. For a permanent solution you will need to extract the boot.wim from the sources folder and inject your drivers into the wim files offline and then save the changes and re-insert into the iso. Inside device manager it sees my Intel Centrino Advanced-N 6235. PE network manager does not. Message is “Not connected – no connections are available” on the Network systray icon. Firstly let me say what a great bit of software this is – I am sure it will be useful in the future. But with both your X86 and X64 builds the portable apps drive (Y: drive?) does not mount. I get a yellow traingle (Win8PESE Warning) on the desktop saying it unable to load iso? This does not happen on your 8.1 builds, I am missing something? Then tried a old HP laptop – worked perfectly (both builds) however this laptop only has USB 2.0 ports; so i moved the memory stick on the problem machine to a USB 2.0 port and sure enough both builds worked great. Any debug info i can send you about this? or file it under “rubbish USB 3 ports” ? Thanks for the update. I like the “file it under “rubbish USB 3 ports. Your info may help other users with the same issue. What do you use to create these discs? I would like to try and build my own. I tried Winbuilder but they switched to commandline only. Maybe you can create instructions? I tried this version of winpe and I’m not able to get PENetwork Manager to work. It detects my internal card but won’t display it in the list. When I used a USB wifi card it displays it but won’t start the wifi service so I can connect to SSID. I tried the windows 8 build which works fine though. did you manually try to start the wifi service in PENetwork Manager? Yes. I also stopped/restarted TCP/IP service and tried different versions of PENetwork. If it works after you do that Then you will have to inject the drivers in offline wim and re-save to make it permanent. It didn’t detect the drivers automatically so I had to install them myself. I already injected the drivers into the WIM so it would boot with them installed but PENetwork still won’t display the card in the list. nice work! cant wait to try it out. Hey, I just got a question. I hate dealing with command line bcdedit, bootrec etc, so I was really hoping hard to find WinPE image with Easy BCD support. You advertise your images to have it built in but I am either too stupid to find it or it’s hidden somewhere in WinPE Environment? :P please could you point me in a right direction? Actually that was an error. It is not in the Windows 10 x86 PE with updateable usb apps. You can of coarse easily download it and place it in the potableapps folder on the usb. It will then show up in the portable apps menu. Thanks for that. I found your WinPE amazing when recovering and fixing my computer. Not to mention the SSD Firmware upgrade which you made so much easier! Thank you! Hello I am a german user, is ist possible to make a start script to change the language (a start-batch)? it might be. But i somehow doubt it. I tried to inject the drivers it gives me an error: “Error: 0xc0000135 An error occurred while attempting to start the servicing process for the image”. I took full control of both folders, the one with the drivers and the one with the image. Can you help me to solve this issue? Thanks. At the risk of sounding dumb. I’d like to ask if it is possible to install this Operating system onto a HDD ? I appreciate that it is designed to boot from ram and also to be installed onto a USB flash-drive : but the install onto HDD is a thing I would prefer. You’re not sounding dumb. Just that is out of the scope of what this PE is intended for. I really am not sure if it would work. Off hand don’t see why not. Give it a try. Can’t hurt and let me know if it works for you. so you can pretty much run anything from there. bluesceening when I try to swtich hardware? Is there any way to get Windows Store working on this ? Sorry. Not at present time. Hello Dear Gandalf!!! – GREAT WORK !!! 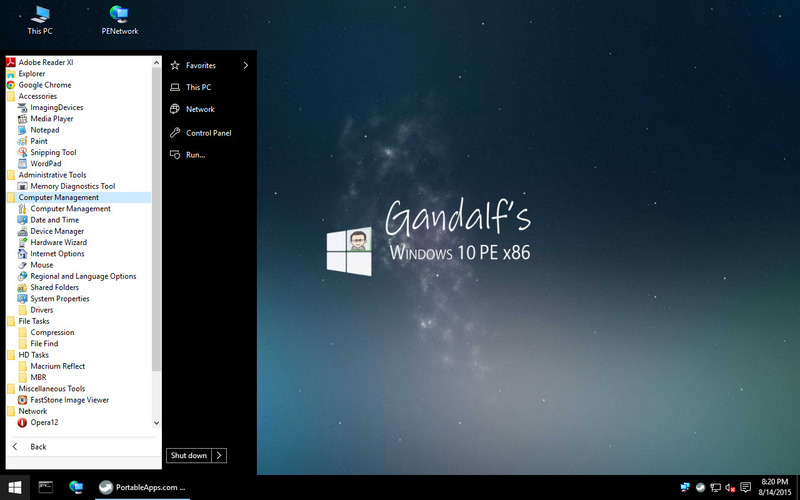 The question is regarding win8PE and Win10PE. I have mounted the WIM file and removed few app’s to reduce the size of the WIM file. The problem is when I unmount the Image and save it – the size of the WIM remains the same size!!!. What can I do to reduce the Size or what am I doing wrong. Great product. Use it for tech work all the time. I’m trying to create a multi boot USB with your Mini 10, Memtest 5.01 and, Seatools for Dos. I’m using Xboot beta 14 for the creating and all goes well and each product launches with the exception of the portable apps on mini 10 or 8.1. Do you have any suggestions? I’m in the process of updating the portable apps on the windows 8.1 version and as i’m using this on a couple of drives can I just copy the updated PortableApps folder from the updated drive to the other? Cheers for the great work. Having “invalid partition table” error. What is the SHA-1 or MD5 for the ISO? I have uploaded the checksum files for both versions on mega and onedrive. What kind of DISM do you use to work on the windows 10? Or do you use imagex? Can you please refer me to the specific place? For the love of God, I can’t get this thing to boot on any computer. I’m using Rufus (which I’ve used a million times in the past) and a 16GB Lexar flash drive. Won’t boot UEFI or standard. Okay. I got it to work on a really old laptop (non-UEFI). Is there any way to make this bootable with UEFI? I’ve tried a lot of different ways in Rufus and when I try to boot on a UEFI computer, it gives me a security failure warning (even if I choose GPT and Fat32). Do you have RDC (remote desktop connection) script integrated in the built. Any chance of including windows RDP in the next release? I have tried but not working. Missing some dependencies. But… Teamviewer can do 99+% of most things? Works like a charm. How about adding Bitlocker support in your iso. All the PC’s we support are encrypted with Bitlocker and without that support in the recovery disk I am unable to use the tools. it’s will be there, in the soon to be released next build. 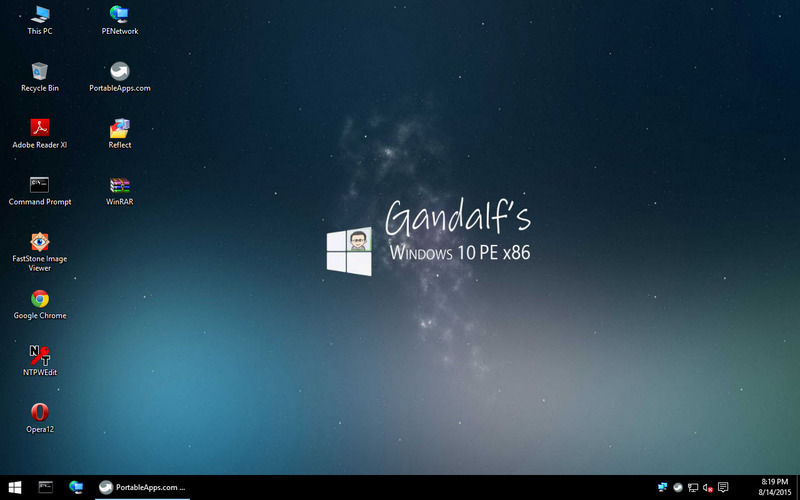 I am on Win8.1 UEFI and would like to boot with PE10. Will the Win8.1 drive be visible? So I can make ghost images? Does this build include Microsoft Security Essentials? Is there a reason why it can’t be included if it’s built into the OS? Also, when you say we can install new applications does this mean I can install say for example Seagate’s Windows version of Seatools and it will always be there when I go between machines? Great build as it’s booting faster than previous builds. But it seems network is not working properly cause I can’t ping in and out. Looks like the firewall is up blocking everything. It sounds like you need the proper nic driver installed. Is the PE Network manager loading? Yes the PE Network manager is loading and the drivers are loaded OK cause I can see all 3 nics. I have to give you more details: ping out to another Win8PE machine works but ping in from Win8PE to Win10PE does not. I can ping it from my win10 to the win 10 pe. But why do you even care about pinging into it? 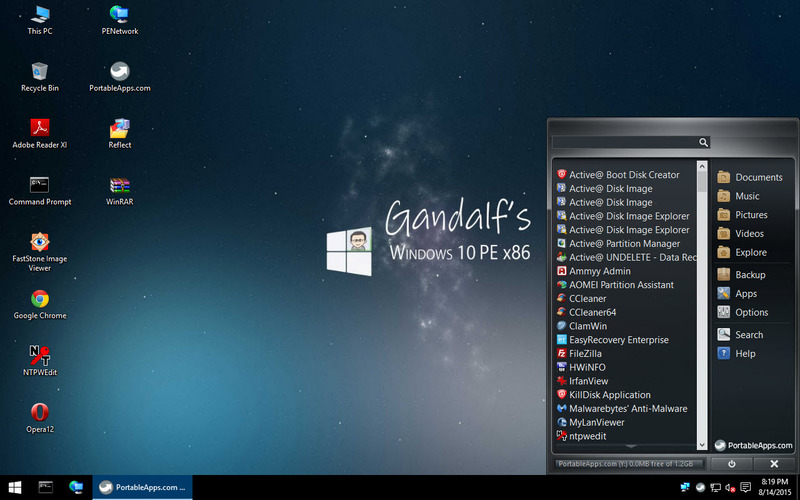 Gandalf, I have stumbled upon your WinPE versions in hopes to finding an alternative to the long lived Hirens BootCd. Hirens Dos programs are obsolete, I have not been able to use one that works well with new UEFI and SATA Hard Disks and baring the thought of mini XP is just not professional anymore. I have turned to your versions of winPE and Easy2Boot. I have been looking to to build my own WinPE version for tools that I use. I got as far as building one that brings me to a cmd prompt and learned how to mount the Wims and repack them back to Iso’s. Your’s is just too cool and already works well. do you have any documentation or any self help guidance after I mount your *.WIM to add programs i.e acronis True image. I really hope its not as easy as Copy and Paste the program files to the .wim directory program files. Unless its a portable app that doesnt need an install, you wont be able to add programs that way. I am planning on making some video tutorials as soon as I have time. Thank You and I am sorry for your loss. This is good, but I have one request though. Are you familiar with Linux in general? If so, I really want to be able to run a minimalist windows within Linux, but with only the kernel that windows needs so that it requires as little as possible of the resources of the computer. I know that the Linux community already got Wine and Play On Linux, but it is missing something necessary in order to accept reg. keys and get the app running without any complications. This should be an easy task for you when being familiar with how Windows works. but can you teach idiot how to update the portable apps? everytime I update both the suite and the individual apps, they don’t save, and I have to reupdate after every reboot. am I doing something wrong? AND can you explain how to install a generic wifi adapter driver so that this may be used in a more versatile manner via wifi?? How are you running it? From a dvd or usb. Are you testing it in a vm? Booting from USB NO VM – just plugged directly into the USB port and using boot menu to boot to USB device. also – i noticed “forms” don’t fill as it isn’t remembering things in the brrowser = and I saved a shortcut to the “desktop” to get back to this thread and it did’t save – is that normal? just trying to figure out how extensive a PE build would be as a “whenever I want” OS – especially with portable apps on it – this would be better than any live CD or actual installed OS!!!! (is it possible to use this is a “backup” daily driver? Anything saved to the X: drive or Windows drive (basically like your C: drive on a normal system) will NOT be saved. So shortcuts, desktop settings, regular installs, etc. will be lost after reboot. Anything on your Y: drive will be saved. You could move shorcuts to the Y: drive and move them back after a reboot. Many things you are trying to achieve are beyond the scope of this PE. You may want to try one of my later builds and see if they behave better for you. One Drive can be flakey. Even though i set the files to not require a one drive account some users still have issues and need to sign in. I have never tried to copy from one account to another. sorry. is there a magnet link so I could get via torrent? i can’t get this thing to download for anything – I’ve been trying for hours and it keeps failing – not to mention, the connection between me and onedrive is horrific – something like 3 hours left to download – at least with a torrent, if a connection drops, it will pick up again rather than just error out and require starting over :-/ TIA! OH, and I updated my portable apps – and as soon as I finished updating google chrome, I can no longer launch it from anywhere – the pinned from taskbar, the desktop, the menu choice in portable apps and navigating directly to the exe in the portable apps directory – it’s weird, it shows up in the task manager for like 3 seconds, then disappears! driving me batty and I really want to use this build…..does your TH2 build have portable apps too???? Thanks a lot for your work. I would love to see Aomei backup as well in this package. How can I add it my self? Hope your wife is in good health, my prayers for her. I came across this site while trying to search for PE support for 802.1x authentication. I wonder if its possible. Thanks. She is hanging in. :) What are you exactly trying to do? A VPN connection ? Thanks for the quick reply, I use MDT 2013 to capture and deploy images (using LTI boot media) but I am stuck ever since my company decided to implement NAC (802.1x authentication) in our environment. I can’t get it to work. is it usb 3.0 compatible? You may need to install a driver. The usb3 will not increase the bootup times of the PE, but with the driver installed it will speed up reads and writes to the USB3 disk. Does it support a 32bit UEFI Tablet? this image can use for WDS? i’m using windows server 2008 r2, can you guide me how to do it? You could use it but many apps that are meant to be on the usb may not work. Earlier versions with the entire build in ram would be better suited for this. the earlier versions means windows 7 PE? now i’m using Windows 7 basic PE x86 is downloaded from somewhere else, and the problems i’m facing is the USB port doesn’t work in Intel H110 or latest chipset motherboard. sorry, i got your link in my email, thank you! It’s possible join wim. to create a system AIO? I want to use this image as a Windows RE. Is it possible to do so, he is loaded are prompted for an administrator password? If it is possible to do that? not at all. are you trying to download?